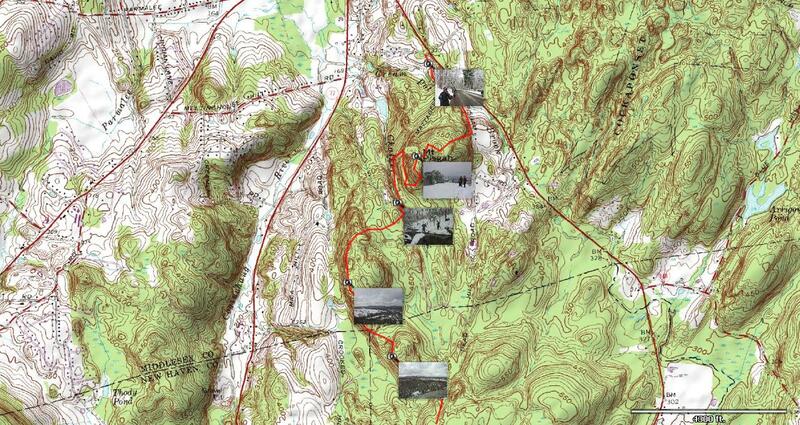 This is the story of the harrowing trail we hiked from Pisgah Road to Route 77 on the Mattabesett. Karen, Mike and I set out early to enjoy a day full of fun, beauty and friendship. It turned into something else. Our day began innocently enough, with a half-mile road walk to the trailhead. As soon as we turned onto the trailhead the hike started to go terribly wrong. We encountered snow-covered tunnels, barely being able to trudge our way safely through. A “scenic view” required us to blaze our treacherous way through the forest. Monsters of green leaped out at us and obstructed our path at times. 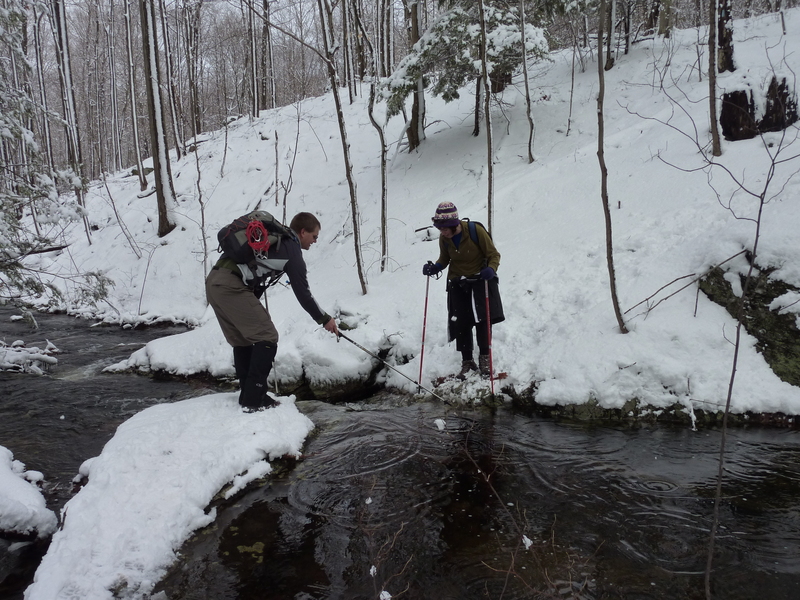 We had to forge a raging river that tested our physical agility. We learned orienteering skills as a pyramid appeared in our midst. We suffered aerial assaults at every twist and turn. Vultures mistook us for food and we had to fight them off. We teetered on the edge of mountains with only prayers keeping us from falling to our death. Boggy swamps tried to grasp a hold and swallow us. Animal urine markings surrounded us. I could just feel the forest coyotes watching us, waiting for us to become their afternoon snack. Just when we thought we had survived and it couldn’t get any worse…the Forest and Park death sign appeared. Our bodies were physically beaten and our spirits were low and yet we had to go on. 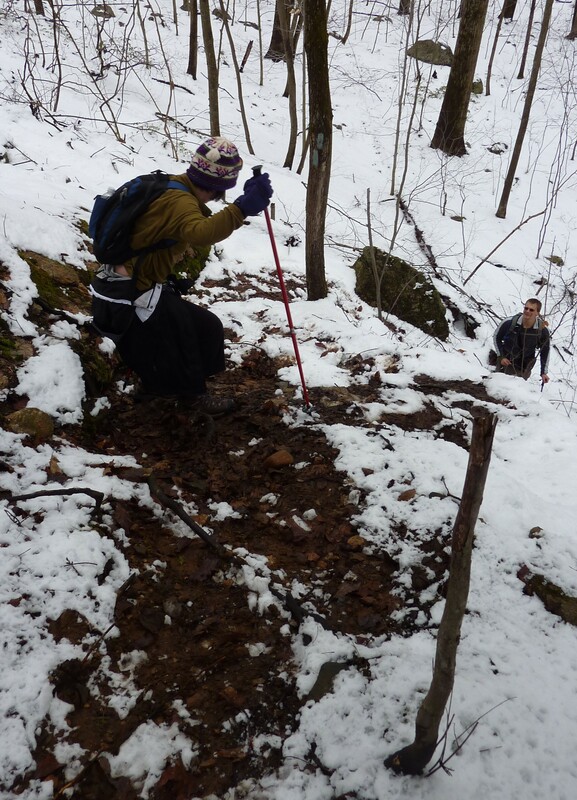 This last section was our undoing with the rugged ups and downs, mudslides and a massive rock formation to go through. We survived barely and the car was never such a welcomed site. It’s all true but I will give you the full details. After the road walk, we quickly ascended a half-mile up to Mount Pisgah. 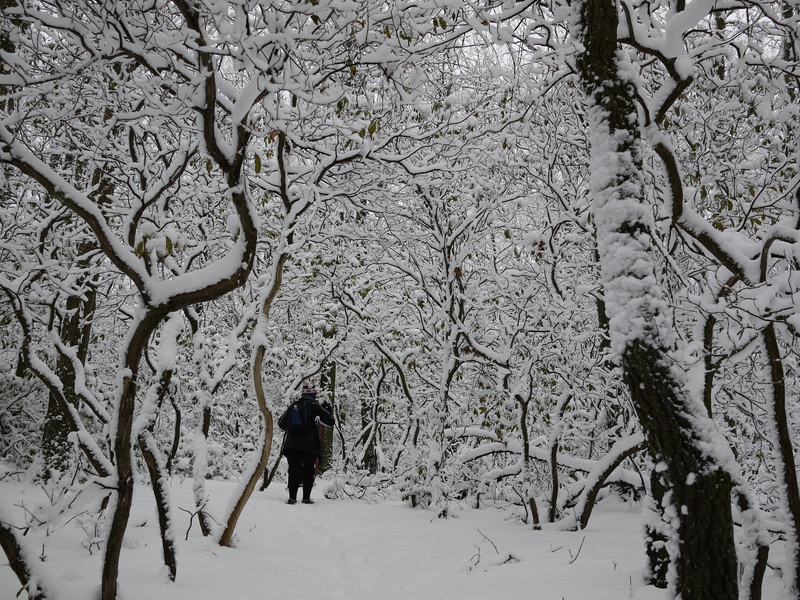 In order to get there, you had to walk through tunnels of mountain laurel that draped over the path, drenched in snow. Once up, the views were pretty, but clouds surrounded us. The snow-covered hills were a quiet beauty. Departing the summit we headed to the next scenic overlook. Unfortunately this path had been swallowed by water and in order to get to it, we had to make our own detour. Unfortunately, the view was not worth the effort. We returned to the blue blazes and shared the path with many of the green monsters. 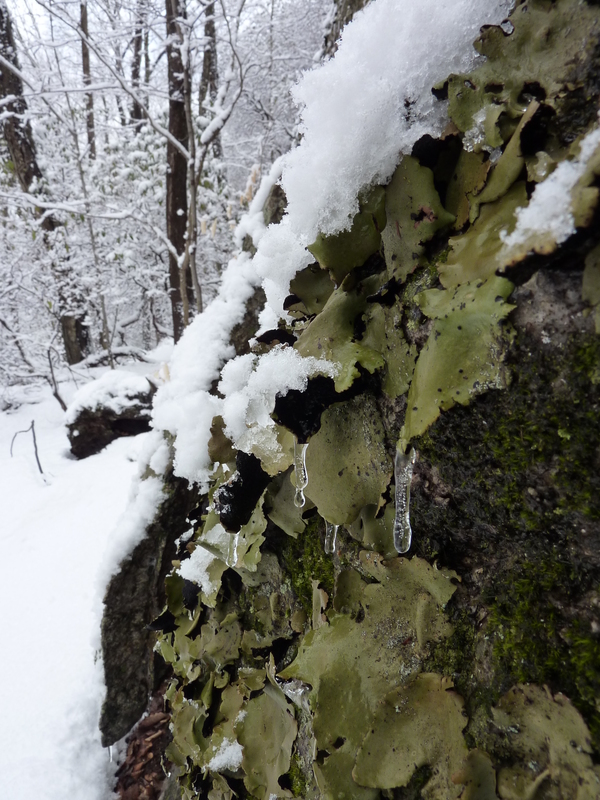 Boulders were covered in green lichen that had icicles dripping off of them. 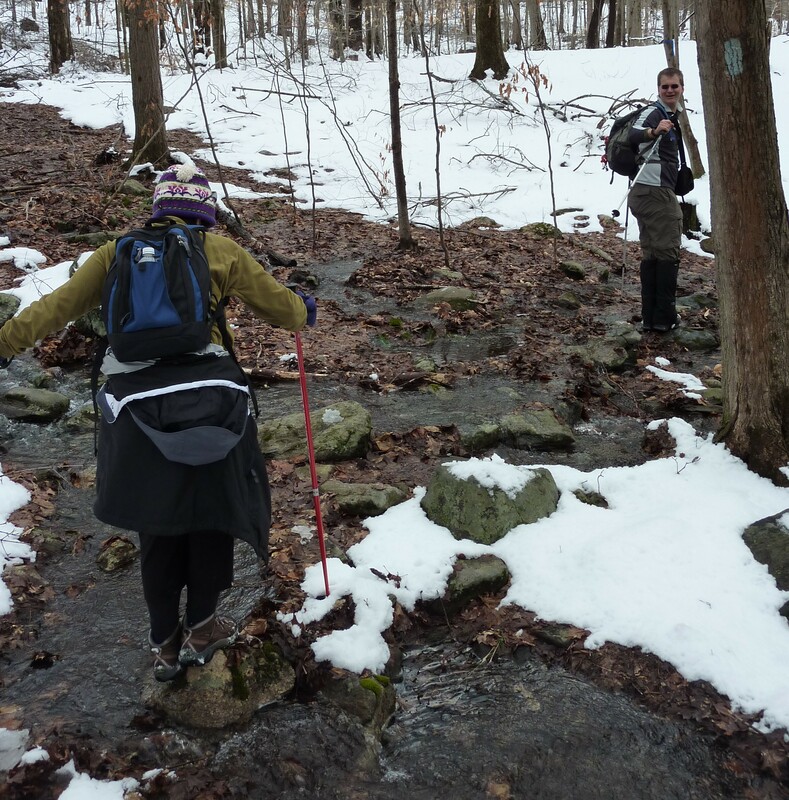 Our next obstacle was crossing Chalker Brook. It was raging from all the rain and snow this week. There was no easy place to cross, unless you were long legged. Both Karen and I are not. Getting across did require physical agility, mental fortitude and the proverbial leap of faith. We both did it with some coaxing from Mike. A pyramid did appear on our path. Luckily the trail went around it, but this boulder was massive. 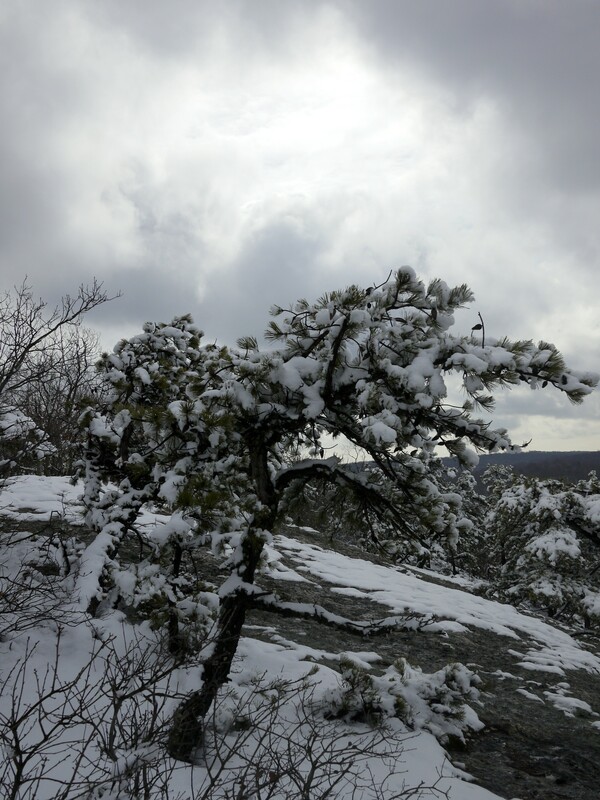 As we hiked the weather warmed up and snow was bombing us from the tree limbs. 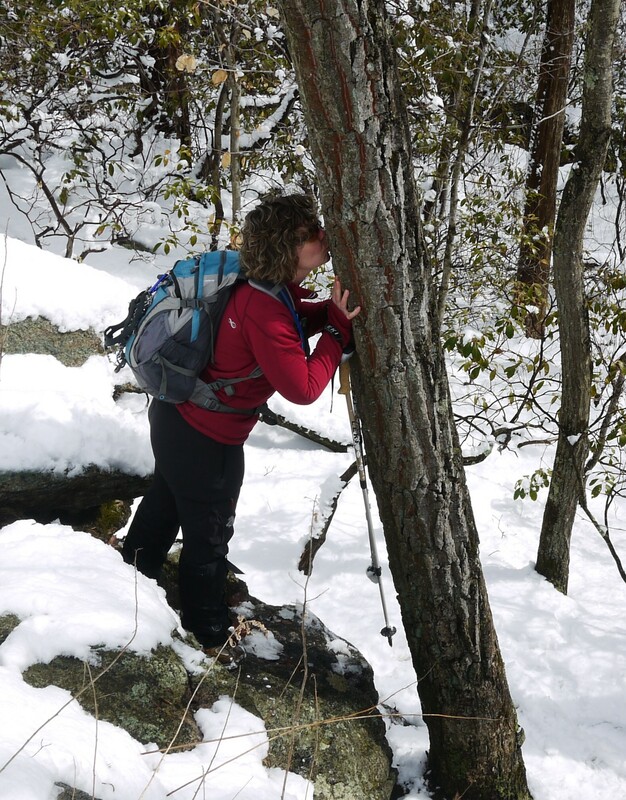 Not to mention if you brushed against a tree, all that snow came crashing down on your head and found its way down your back. 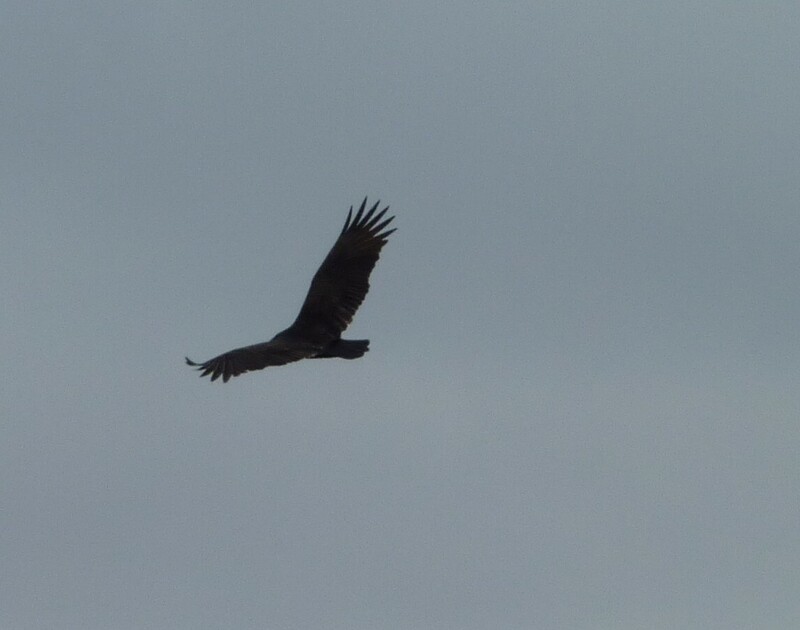 Steeply through a hemlock forest, we weaved our way to the mica ledges with turkey vultures circling overhead. They were gracefully dancing on the thermals, joyfully soaring through the air, looking for tasty morsels to devour. The mica ledges have views that overlook a new housing development and rolling hills. Snow capped pitch pine trees dotted the ridge and made for picturesque scenes. After leaving the ledges, we hiked old forest roads, ups and downs, going through extremely wet, boggy sections that sucked out boots in if we weren’t careful. I started to notice a great deal of yellow markings on this section of trail. 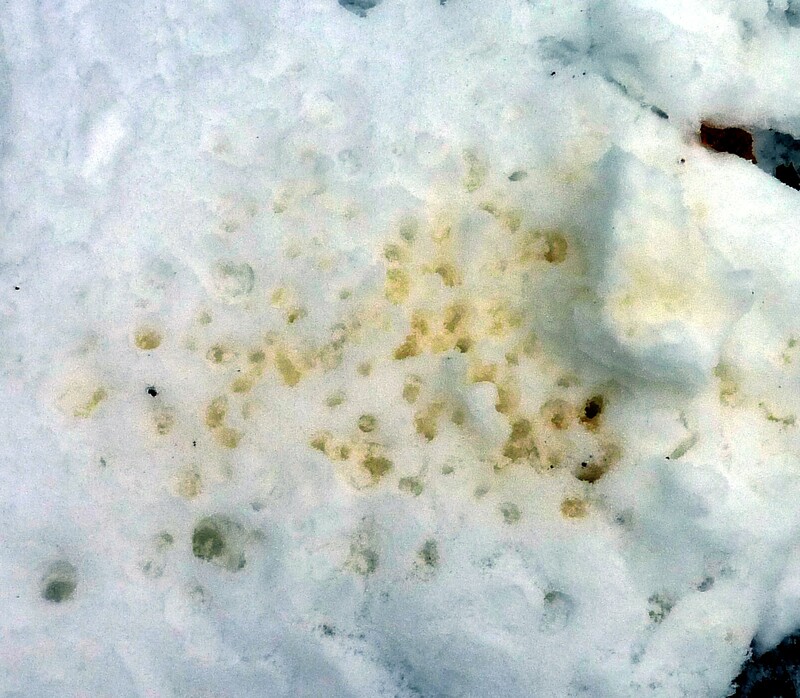 At first I believed an animal was marking his territory, but strangely there were no animal prints by these yellow spots. On closer inspection, I discovered it was “tree pee”. The sap was oozing out of the trees causing the snow to change color. So much for the wild animal theory. At this point we are very tired, legs sore from the demands of hiking in snow. Our GPS tells us the road is only 800 feet away, but the trail map has us going for another mile or so. We could hear the tease of the road throughout this last section. We knew we were ever so close, but the trail had to make its final demands of us. 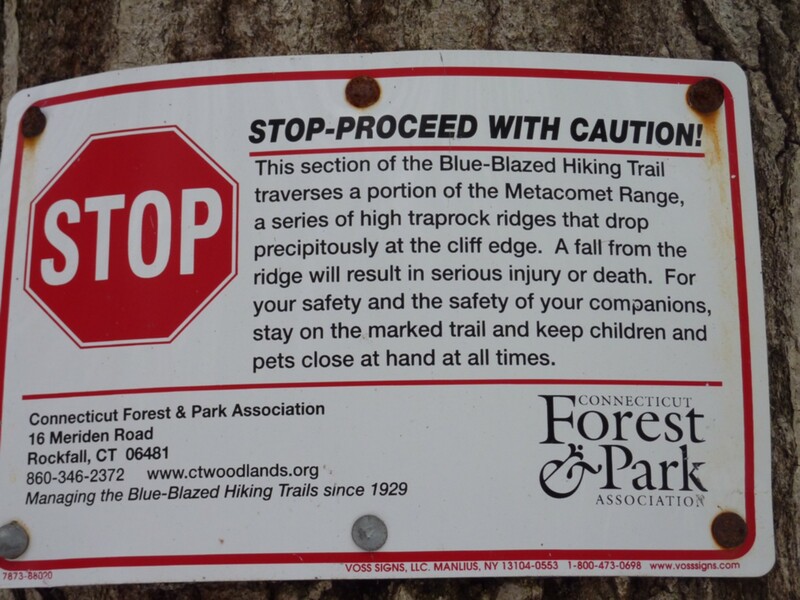 That is when we see the warning sign from the Connecticut Forest and Park Association. We affectionately refer to this sign as “the death sign”. What crazy ledges do we have to climb now, we think? I always worry when I see this sign at the end of a hike, because I’m tired and more likely to make a misstep. We are at the Broomstick Ledges, a series of ups and down, crossing up, over, around and through rocks, boulders and ledges. The worst part was going down a slick spot that was a mini mudslide. This required sure footing and pole support. As we ascend the final hundred feet to the car, I review the hike and realize we have an exciting tale to tell with a few embellishments. So my friends you see the story was a true one, a little imagination never hurt a good story to be a better story. 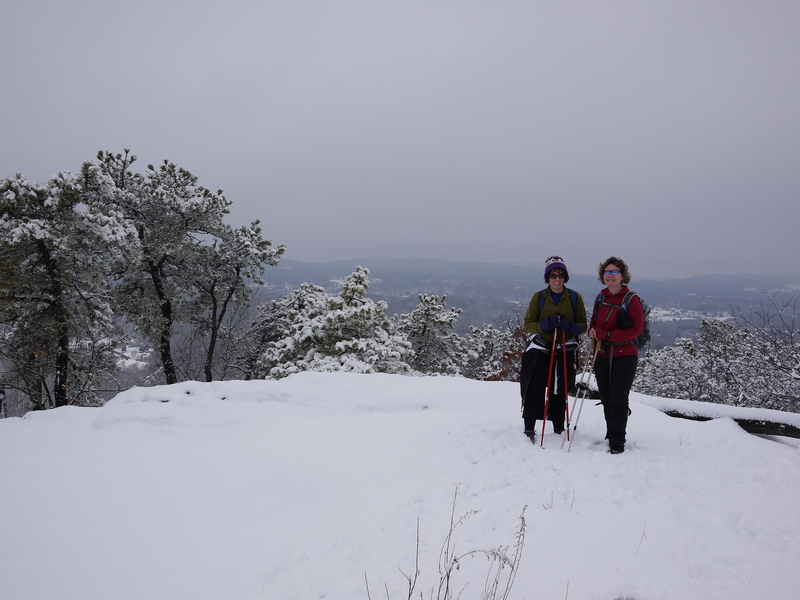 We did have a day of fun, beauty and friendship on the Mattabesett. 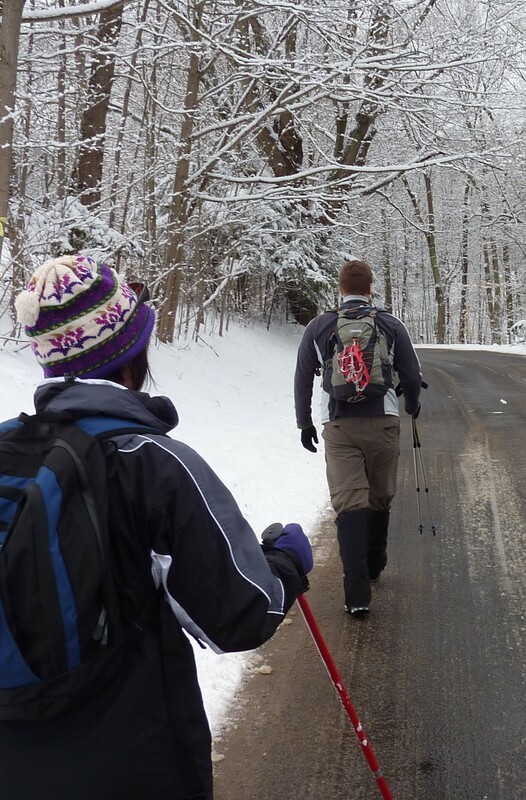 Details: Mattabesett Trail from Durham to Guilford. 7.5 miles ( a little less, the gps wearer had to double back at Chalker Brook while looking for easier crossing for us short legged people, no found). Parked at Pisgah Road at a small turnoff. Had car waiting for us at lot off of Route 77 below Bluff Head. A little over 5 hours for us to hike it. wonderful! it almost makes me want to go outside!